First responders and soldiers require extensive emergency training, and shipping containers provide a scalable and customizable solution. Our container-based, first responder training facilities are fast to deploy and create realistic settings that allow organizations to train first responders at a fraction of the cost of comparable city-grids and mock villages. Windows with total-blackout rolling covers. Staircases for multi-story training scenarios. Draining floors for fast water cleanup. Painted interiors and exteriors for added realism. Custom options create first responder training facilities that fit your program. First responder training facilities made from modified shipping containers are fully functional as individual units or stacked into more complex structures. Customers can order shipping container training facilities in fast deploying phases. Falcon’s designers are prepared to help create a customized training facility solution for your needs. Fast Deployment. 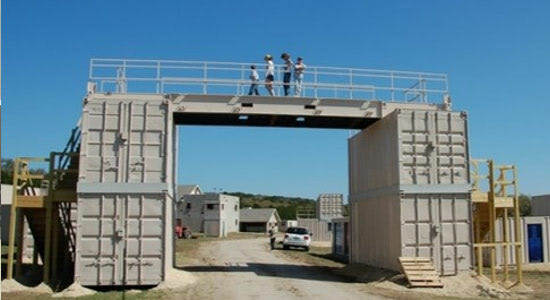 Falcon Structures can deliver shipping container training facilities within three months of the initial order. In most cases, installation takes less than a week. Option to Install in Phases. Organizations can spread the cost of their shipping container training facility over several budget periods by ordering a few modified shipping containers at a time. Cost. 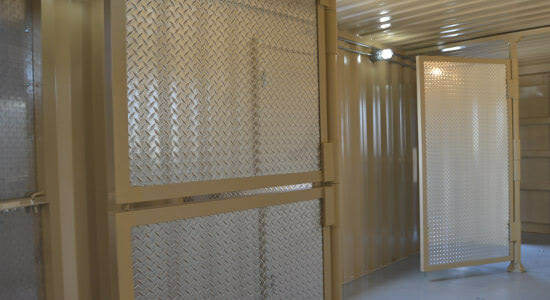 According to our customers, custom shipping container facilities cost a fraction of the price of stick-built options. Customizable Features. Falcon Structures' design team will create a unique solution for your needs. Turnkey. Plug and play electrical and plumbing components are included. Low Maintenance. Corten steel modified shipping containers can withstand action-intense trainings with minimal damage.